A Monster Calls is quite different from Patrick Ness' The Knife of Never Letting Go, and, I should think, from the other two books in the Chaos Walking series, as well. Knife – do correct me if I'm wrong – is post-apocalyptic and dystopian by way of genre, while Monster is more contemporary YA. As I had mentioned in one of my previous reviews, the latter genre is more my cup of tea than the former. At first, I touted the book as a light read. Well into the narrative, however, I found out how wrong I was. The writing was light and easy to comprehend, yes. But the theme and prevailing atmosphere throughout the story were anything but. Conor is a 13-year-old who finds himself forced to think and act, instead, like a 30-year-old: his mother is terribly sick and undergoing treatments, nothing of which appeared to be making her better; his father has gone off to the United States and now has a different family; his classmates have been treating him like he has some sort of a disease, and a bunch of them have found tormenting and bullying him an enjoyable pastime. With the situation in which Conor found himself, he is therefore portrayed as an angry, broken, and resentful teenager – until one day, at exactly 12:07 in the early morning, a monster appears at his bedroom window. This is the part where the story unfolds. To say that the book is heartrending is an understatement. After all, it deals, principally, with loss, how a young man goes through the pain, and attempts to cope and come to terms with it - plus all other difficulties thrown in for good measure. As I read the book, I couldn't help but think that, although the monster was portrayed as an entirely different character from Conor, in actuality, they are really one and the same persona. Thus, the conversations and events between Conor and the monster are simply Conor dealing with his problems by himself – facing his own monster, so to speak. I completely relate to Conor, for what reason I will not state lest I spoil the book for anyone who may want to read it. What I will say, though, is that being in the situation in which Conor found himself is never easy, no matter what anyone might say to the contrary. Likewise, people deal with heartaches and pains in different ways – so we should never judge. I loved this book and I'm glad you loved it as well. 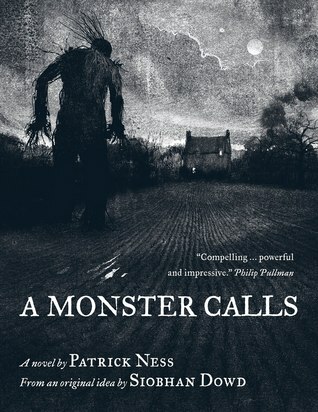 I think Patrick Ness did a brave thing to articulate Conor's emotions that way, and it was something that resonated with me too.